Caption slip reads: "Photographer: Richardson. Date: 1952-03-10. Reporter: Swaim. Assignment: Foreign Students -- Pasadena City College. K17, 18: English class for foreign studdents at PCC, with American students as tutors. 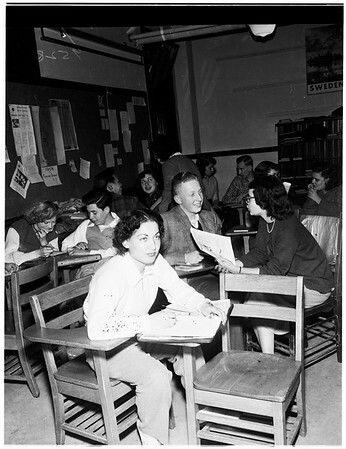 In foreground, Otto Gminder, 16, (left), stone deaf boy from Bavaria, gets book-and-lip instruction from Kathy Corwin. Also, Miss Gertrude McCoy, right, (seated), retired teacher, gives time to teach English to Tsuneo Tomatani, 12, Japanese. Standing are: Dr. Robert Yeaton, teacher of class, and Kay Risser, student commissioner of scholarship. K3, K4: Najmeh Najafi, 22, left, niece of Premier of Iran, studying alone, while stone deaf Otto Gminder, 16, from Bavaria, gets tutoring by book and lip reading from Kathy Corwin, volunteer tutor.